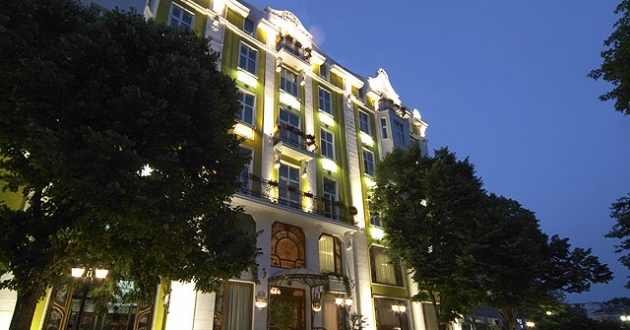 Location: The hotel is situated in the heart of the sea capital of Bulgaria. All administrative buildings and places of interest are within a walking distance. Accommodation: Grand Hotel London offers 8 standard rooms, 4 deluxe rooms, 8 studios, 4 junior suites each with a unique design. Each room is equiped with air-conditioning system, personal safety deposit box, cable TV, mini-bar, telephone, Internet access, 24-hour room service. Food: The sumptuous interior of Grand Hotel London Restaurant creates an ambience of festivity and glamour. To complement your meal, enjoy a wonderful selection of fine wines from an extensive wine list. There is also 24-hours Lobby-bar with terrace. Sports and facilities: Fitness centre, recreational centre offering sauna, massage and aromatherapy. The rates include: breakfast, Internet, safe, fitness, parking, and all taxes.